Usually I am turned right off by these zeitgeisty buzz words but do you know what? I am a huge believer in mindset when it comes to parenting a picky eater. Gary Klein PhD, writing for Psychology Today, defines mindset as “a belief that orients the way we handle situations”. In this article I am going to explore three very common but unhelpful feeding mindsets and the beliefs that underpin them. I’m going to suggest new beliefs which can totally re-frame how you think about mealtimes. There are so many good reasons why parents adopt this mindset; maybe they are anxious about the amount their child is consuming or maybe they are concerned about nutrition. This mindset is 100% culturally normal; it can feel like an intrinsic part of being ‘a good parent’. Once you let it go though, it can be such a huge relief for both you and your child. Swap this for: It is my child’s job to decide how much of what I serve to eat. This is in line with Ellyn Satter’s Division of Responsibility model; a trust-based approach to feeding children. Your job is to set the content of meals and snacks (what you eat) and decide where they happen. Your child’s eating decisions are then down to them. Please note: if your child only accepts a limited range of foods, to make this model work for your family, make sure you always include safe foods with every meal and snack. Again, it is totally understandable if you feel this way. When children are very limited eaters, you can become habituated to focusing on them and their eating decisions. All the talk is about the food - why they should eat it - how they should eat it. It is really hard for mealtimes to be about anything else. Swap this for: The most important thing about mealtimes is that we can relax and enjoy one another’s company. As soon as you shift the focus onto the social side of meals, it becomes much easier to move away from exerting pressure on your child to eat. Check out The Family Dinner Project website for lots of ideas on how to get the conversation going around the dinner table. Belief: I need to be focusing on short term food-related goals. This mindset is all about ‘now’ - what your child eats at that meal or that snack. You are weighing up the ‘success’ or ‘failure’ of a mealtime based on their eating at that sitting. Whether they try something new... whether they eat what feels like a decent meal…. This mindset can really start to affect your mood, as your child’s eating becomes enmeshed with your feelings. Swap this for: I need to prioritise long term food-related goals, like helping my child enjoy anxiety-free meals, helping them build their eating skills and confidence and helping them learn to eat in response to their body’s cues. That way, even if your child has just sat down with you, eaten one safe food and chatted about their day, you can feel positive about it. The problem with the three unhelpful mindsets described above, is that they lead to what researchers call ‘controlling feeding practices’. These are approaches (used by parents everywhere) that are basically ways of persuading children to eat, (or not to eat). Negotiating, bribery, persuasion, talk of how good something will be for your child’s body… all of these fit under this umbrella, as does restriction which I wrote about recently. Controlling feeding practices can bring tension, conflict and negativity into a meal - all of these things make picky eating worse. They also lead to your child’s eating being motivated by you rather than by their body. This might seem okay (as long as they eat, who cares why?) but there is study after study demonstrating that effective self-regulation is at the heart of a positive relationship with food. It paves the way for children to make genuine, lasting progress with their eating - something that it very hard to achieve when they are only eating because of pressure from adults. It can be really hard to make that shift away from trying to get your child to eat - it may feel counterintuitive and even anxiety provoking. Make sure you have had your child checked by their health care provider so you can relax in the knowledge that they are doing fine physically. Read all about good practice in relation to feeding (the Ellyn Satter Institute website is a great place to start) and give yourself time to work on re-framing how to handle mealtimes. 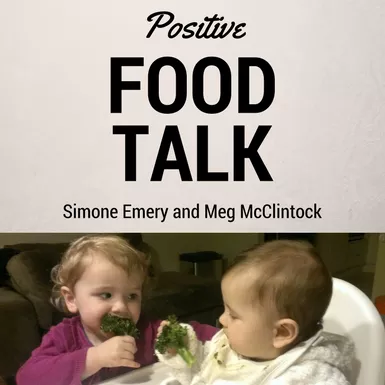 I wanted to share a video resource with you in which two truly inspiring feeding professionals (Children’s nutritionist and picky eating specialist, Simone Emery and Dietitian Meg McClintock) get deep into the whys and hows of handling mealtimes, especially in terms of the language you use and how to replace controlling feeding practices with positive ones. It’s not free, but it’s such a worthwhile investment as it is packed full of great information. If you feel that you can recognise any of the mindsets described above, this video will be so helpful for you. Just to be super transparent, this is an affiliate link. This means that (at no additional cost to you) I make a small commission if you purchase. I only ever share affiliate links for products and services I can vouch for, so see it as my seal of approval! Please note - the price is in Australian dollars, it works out approximately (at the time of writing) as £15 GBP or $20 US.